How is today the last day of the giveaway series already!? I had SO much fun sharing all these incredible brands and giving away such fun prizes to my awesome readers! I couldn't do a giveaway series and not include a skincare giveaway since we all know I will always try any skin care product, especially one that is all natural and from the Dead Sea! I have an even better story of how I came to know this brand. Back in 2010 when I was living in Arizona, a friend invited me to a spa day with a brand that was headquartered in Phoenix. I tagged along and got the most incredible facial and left dreaming of getting this product. Well since I was on a college student budget, I didn't get the products and have been kicking myself ever since. To be honest, I forgot all about the brand until my friend Lindsay asked me if I heard of the brand. I initially said no, until I realized it was the same brand I had loved so much back in Phoenix! Funny how things come back around years later! I was sent a sample kit of the Seacret line and fell in love with everything, as it made my skin literally feel amazing instantly! The whole line is created from minerals found in the Dead Sea, so its definitely going to make your skin feel incredible! When Lindsey told me she was going to offer one lucky Stylelista Confessions a chance to win three of their incredible products, I was stoked to share the brand with you all! Mineral Rich Peeling Gel- Clean and purify your skin with Seacret™ Mineral-Rich Peeling Gel, enriched with Dead Sea Minerals and plant extracts. This special gel gently exfoliates the skin, helping to remove direct and build-up on the skin, leaving it soft and smooth. 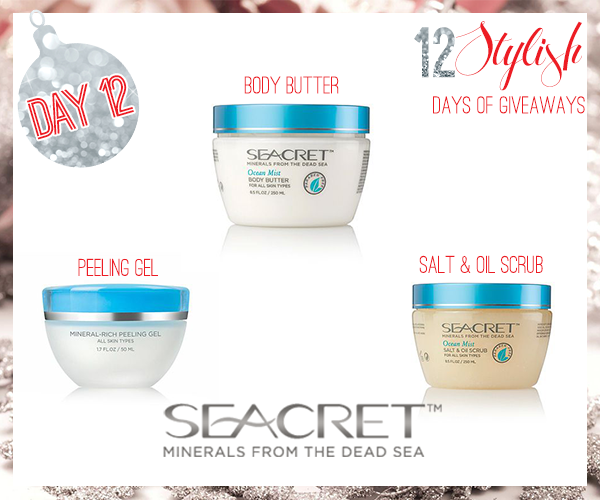 Body Butter- SEACRET™ Body Butter enriched with Dead Sea minerals – replenishes dry skin and restores its healthy glow. A nourishing blend of Vitamins, herbal extracts, Natural oils, Shea and Cocoa Butters moisturize for an overall feeling of rejuvenation. Salt and Oil Scrub- SEACRET™ Salt & Oil Scrub - enriched with Dead Sea minerals - gently exfoliates dry skin stimulating cell renewal. A refreshing blend of natural oils moisturize for a healthy, rejuvenated glow. So let's get to the giveaway... this is the final giveaway of the series so enter below using Rafflecopter, and check back on Thursday to see if you're the winner! Good luck! Again, THANK YOU to every brand who was so generous to give away such amazing prizes and thanks to all my readers for making 2014 such an incredible year! I cannot express how thankful I am!